technical expertise, sensitivity, and flexibility needed to photograph whatever I encounter. I am creative, energetic, and properly equipped to bring the studio on location-anywhere. editorial illustration, multi-media, public relations, and wedding storybooks. Industrial, Legal, Medical, and Weddings. I began my career as a full-time, award winning, photojournalist at the Capital Times, Madison, WI. (1969-77). I covered human-interest stories, lifestyles, features, sports, and news. and receptive to everything around me. I grew to respect the dignity of all people. Journalists honored me with the Sigma Delta Chi Distinguished Service Award in News Photography. Following my newspaper career I freelanced for many national magazines including TIME, Newsweek, and National Geographic. and WPPI [Wedding and Portrait Photographers International]. and eye for detail that are evident in my work. I studied with Ansel Adams in Yosemite, California, in 1972.
and beauty of Nature which I endeavor to convey in my landscape and nature photography. as well as fine-art photography for collection and interior design. I am continually upgrading my extensive camera systems and lighting gear. I have backups for all equipment I use. 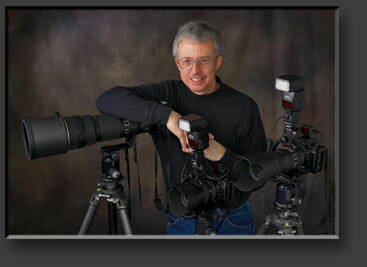 I am now photographing everything with five high-end Nikon professional digital cameras. My current lenses range from 14mm continuously to 600mm (film equivalent).